Don't Track Badges of Justice and other Items? Hi I'v just started using rapid raid and so far im finding it awesome. What i need to know is, is there any way of setting it so Badges of Justice dont show up as items or do i have to manually delete them after each raid =( iv had a good poke around but cant seem to find a way. Now that Badges / Emblems are considered currency, I am unable to shift+click to add it to "/rt io". Is there another way besides just waiting until one drops to add it? I tend to get caught up in looking at new shineys to remember to do that. I'll make a note to look into adding the currencies into the default /rt io list. I know there is a way to do it. I was able to shift-click an Emblem of Heroism from my AtlasLoot to add it. Also, when you turn in a daily heroic quest that gives you emblems you can shift click the item name from your chat window. But it still appears in the rt. Is this correct? Or it only means that it won't get exported? 1. Did you add the item before they dropped? Doing it afterwards won't do anything. 2. Did you click the item in /rt io window and tell it not to track them on the options that pop up on the right side? 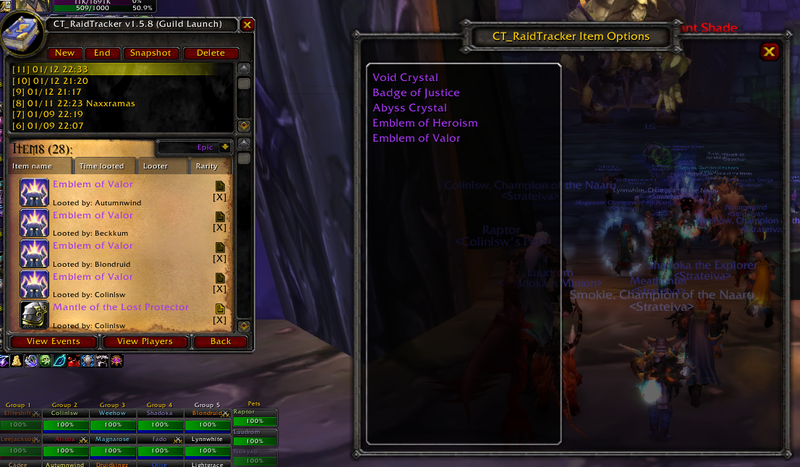 - Yes...i uncheck the auto loot box so that i can shift click into the command when the item drops. Now that it is in the menu....i suppose the next new raid will take effect? I can't seem to find the answer to my question very easily so I will ask it here as it relates. So I have excluded badges and enchanting mats (like Abyss Crystals) from Raid Tracker but is there a way to do the same with DKPMon. Everytime I disenchant an epic the crystal pops up in the award loot window. There isn't a way to exclude items in DKPmon. However, it is easier to remove than it is in the Raid Tracker by right clicking them and choosing "Remove" to have them disappear. This is much different than the raid tracker where you have to go into submenus and dialogs to accomplish the same thing. Also, if you exclude the item in the Raid Tracker and are using DKPmon with logging then the item shouldn't pass through to the XML import.